Where do I use my Go Groopie voucher code? Add your products to the basket. When ready to proceed go to your basket and sign in or create a new account. On the payment details screen click the promo code text and then enter the code into the box that appears. Click 'Apply' to get your discount. "Up to 90% off when you join GoGroopie." "Download the free mobile apps." Never pay full price for anything again with the huge variety of offers available on the Go Groopie website. With fashion items, items for the home, pet accessories, car accessories, health, sport & fitness products, items for children, local experiences, short breaks and more all with a nice big discount attached. You'll wonder why you haven't discovered Go Groopie earlier. How does Go Groopie work? If you have heard through friends, family or co-workers about the fantastic deal they have taken advantage of on Go Groopie but you are unsure about how it works, then wonder no more. Go Groopie is a marketplace which means that all deals listed on the website will be sent out to you directly from the business that made or sourced it. You simply buy a voucher code through Go Groopie (these may well be limited in numbers so be sure to snap up anything you really want quickly). You can then redeem the code directly with the business to receive the product or service at the discounted price. You will do this by either entering the code on their website or show the voucher in store for and local deals. 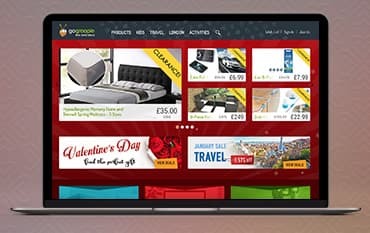 So whether you are looking for a really unique gift, something for your home or a fantastic day out, then have a good look through the deals on Go Groopie and bag yourself a bargain. Go Groopie has a fantastic travel section jam packed full of huge discounts. Go Groopie will negotiate big savings for customers to enjoy all their deals and the travel section is no different. In the travel category you will find heavily discounted hotel stays, holiday extras and holidays both in the UK and overseas. Whether you are looking for a city break, a beach holiday, a family holiday or hotel deal, you will find a brilliant assortment of offers at Go Groopie. Be sure to check the fine print for any deal that you are interested in as this will list the dates that are available for you to travel, any exclusions, blackout dates and other important information regarding each deal. New deals are added to the section regularly so be sure to have a browse to see if where you want to travel to is included or perhaps even get some inspiration for your next trip. Go Groopie have an app available to download on both apple and android devices. The app makes it easy for you to browse all the amazing deals listed on Go Groopie while you are on the move. The app is easy to download, with the links readily available on the Go Groopie homepage. You can then start saving on thousands of products and local services, at any time, wherever you are. Where Can I Find My GoGroopie Voucher? In your email inbox: Vouchers will be sent by email as soon as you have completed payment. In your account: Login to your GoGroopie Account and click on ‘Orders’ Click on ‘View Voucher’ to download a printable PDF version of your voucher. Why can't I find my voucher? If the voucher email is not in your inbox, please check your spam folder (add GoGroopie to your ‘safe senders’ list). If you still can't find it log into your account and print off the voucher instead, or contact GoGroppie. Once you have received a product you have 14 days to request a refund. Unfortunately, travel vouchers are non-refundable once booked – unless there is a specific cancellation policy stated on the individual deal. If you love a great deal or two then you’ll love GoGroopie, with an ever-expanding list of ace deals and discounts on all kinds of things, from days out and experiences to various products from big names. And if you use a Go Groopie voucher code you can save yourself some cash at the checkout. If you’re stuck for gift ideas then this fab retailer might have just the thing you need, with a fantastic choice of experience days, from flying a Helicopter to staying in a fancy hotel, there’s plenty of offers here which will be sure to sound like a blast to someone you’ll know!